The phone rings and I hesitate as caller ID flashes into view. I don’t have to press ‘answer’. I already know the question. There’s a laundry hamper brimming with active wear – after all we are busy people. And our fridge is stocked well for a feast, as long as it’s made completely of condiments. I desperately need to go shopping. The dentist appointment tomorrow and the hair appointment the day after that. The phone has now rung twice. Oh shoot! I promised to babysit all day Thursday. And when will I find time to write get well cards? My thoughts like springs, bouncing from cell to cell, gathering reason. The phone has now rung three times. My sporadic freelance editing job lays on my desk, thesaurus and grammar guide wide open, purple ink pen at the ready. This job I prayed for, and now time escapes as though the Earth has cracked and minutes are slipping through. The request just inside the ringing phone is not convenient. But I answer. The voice on the other side is weak and tearful. “I’m having a hard day,” she says. “Would you be able to take me to lunch soon?” I think, but then do not say, what I’m thinking. I already know the right answer. “Could I take you to lunch tomorrow? I can pick you up right after my dentist appointment.” Doing the next right thing colors outside the lines of convenience. Retirement has turned the virtues of a non-scheduled life into a teeter totter of chaotic commitments. The things that are convenient rarely align with those of highest value. Instead of clambering to meet a deadline, I took my friend to lunch and afterward we took a long, quiet drive over miles of country roads, revisiting the area where she once lived, married, and raised her children for over 90 years. Love isn’t a matter of convenience, it’s a matter of compassion. “Love isn’t a matter of convenience, it’s a matter of compassion. The Lord is gracious and compassionate, slow to anger and rich in love. 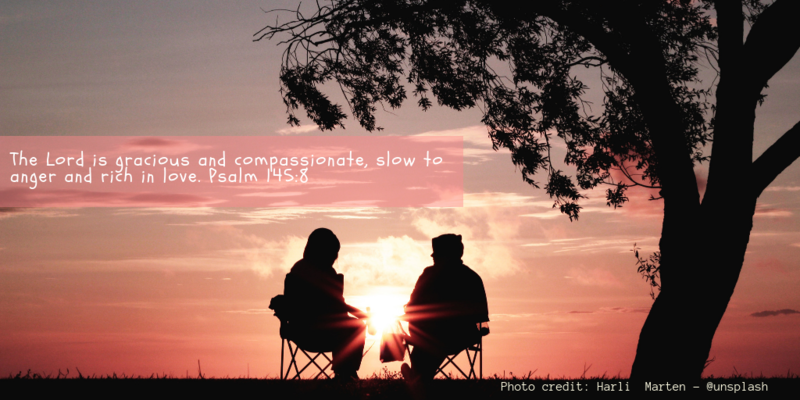 – Psalm 145.8” This! God has called us to love people, not schedules. This is the realest kind of love. Thanks for the poignant reminder that real love is sacrifice. Blessings in Jesus name! Vicki, thanks so much for your kind words. I don’t think compassion and convenient are used in the same sentence. I am thankful that God gives us discernment and insight to Know when someone needs to feel valued and cared for. You have struck a cord. I am going to write this “Love isn’t a matter of convenience, it’s a matter of compassion.” and this “Doing the next right thing colors outside the lines of convenience.” down in my planner to remind me that I have to have compassion when opportunity is placed in front of me ESPECIALLY when it’s not convenient. I appreciate your candor. So thankful to be your FMF neighbor. Blessings! Robin, what a precious response. I’m glad you were able to change your perspective a little bit. You’re right. Opportunity to show compassion is most needed ESPECIALLY when it’s not convenient. 🙏❤️ You can do this. “Love isn’t a matter of convenience, it’s a matter of compassion.” Yes! And yet the struggle is real sometimes. Thankfully, that’s when I realize that I can only love because God loved me first.